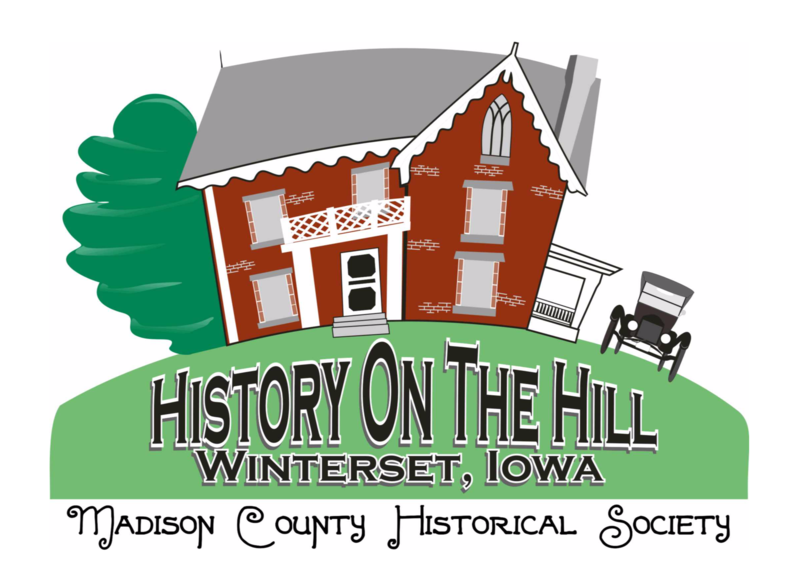 The Madison County Historical Society is a non profit organization whose purpose is to collect, preserve and exhibit artifacts that reflect the history and culture of the people of Madison County, Iowa. The Madison County Historical Society has deep roots, and branches out in many ways to educate people about our county’s heritage. We bring history to school groups, local residents, senior citizens, tour groups and visitors from many states and foreign countries each year through visits to the museum. Madison County is not only indebted to Herman Mueller for founding the Historical Society in 1904, but, also for recording and preserving its early history. We have in our collection, 10 boxes of notes of all kinds of business, and etc. that he retained. The names of many men who we read about in the county’s history are recorded as being in the Auditor’s office in the courthouse on March 4, 1904 to establish a historical society. Some of the names you’ll recognize T.H. Stone, John Parish, E.R. Zeller, J.C. Clark, C.C. Schwaner, O.L. Evans and J.A. Way. These eight men with Mr. Mueller drafted a constitution and by-laws and are the charter members. Public monthly meetings were held and a paper presented by one of them at the meetings on something of local interest or of historical value. These were short lived. In 1920, a room on the courthouse 2nd floor was used for the society’s acquisitions. In 1929 on its silver anniversary, Mr. Mueller was still president and so we assume from his notes he had been for the first 25 years. In the period of 1920 to 1960, no history of the society could be found, but sometime within this period the acquisitions were moved from the 2nd floor to several rooms on the third floor. Many of us remember visiting these by appointment. The rooms were tastefully done under the guidance of two Antique Club former members Dorothy Beeler and Madolyn Morrisey. Dorothy would come to Winterset and stay several days at a time to work on this. In May of 1960 the society was reactivated. They formed the “Covered Bridge and Historical Society Committee.” At this time Irvin Martens was President and Dale Callison Secretary and Treasurer. Among other active members were Gene Madsen, Clifton Smith, Dorothy Beeler, Lloyd Smith, and Dr. Ilgenfritz. In Sept. of 1960 George Montross and Dr. Ilgenfritz asked them to assume the functions of the Madison County Historical Society, which they voted to do. In the spring of 1973 the society was advised to vacate the courthouse rooms for a County Engineer’s office. From this time forth the society began to move. No free place could be found, and with no money for rent, acquisitions were stored in the Courthouse basement and the Farmers & Merchants Bank basement. While the items were in storage, several methods were used to advise the public of the need of an area for exhibits. At this time the board members number was increased to 15. In February 1974, the board was called to meet in Shirley Webster’s office to advise us on an anonymous donor’s donation of 18.5 acres of land, June Kaser’s place, for a museum and developing a historical complex. Of course we all know now that was Margaret Guye. We had a topographical survey map done and met with architects for a rough idea of money needed to build. We received IRS approval for a tax-exempt status and a fund drive began in the fall of 1976. There were minimal funds collected. In July 1978 we were advised that Clifford Jordan of Cedar Rapids was giving a memorial for his parents, and promised to double it if the community would match his gift. The funds were to be used for a basement and first floor structure. This was the boost we needed. Many individuals, clubs and organizations answered the call for funds. Major contributors were Margaret Guye, Gilbert Aikin, June Kaser, Charles Taylor, Asa Smith estate, Dale & Dora Callison Estate and the Schwaner-Giffin Trust. Construction of the museum began in 1979 by Tyer Bros. of Winterset; architects were Wagner, Marquardt, Witherell, and Ericson. We regret that about the time of construction Mr. Jordan died suddenly of a heart attack. His parents were Tally and Lillian Tilton of this community. In 1979 the log school was moved to the complex, a gift of Eunice and Paul Hann. In 1980 we were advised of a trust fund established through the Emma Schroppel Estate for the maintenance of the site. We receive interest from this fund. With construction done, the enormous job of moving and setting up displays was started. By September 1980, enough had been done to start showing if off and for the first month tours were held for clubs and organizations who had given financial help. It opened to the public for the Covered Bridge Festival in Oct. 1980 and formally dedicated Nov. 2, 1980. Also in 1980, the Stone Barn and Stone Privy were restored and with the house admitted on the National Registry of Historic Places. Also at this time the North River School was admitted to the registry. The Post Office was donated and restored by Marguerite Gallery as a memorial to her husband Dan, a local attorney, in 1982. In Nov. of 1982 the board president, June Kaser, died, and her house became a part of the complex. The committee for its restoration was Wayne Breeding, Lucile Graves, Tim Beeler, and Clarence Lucas. The antique club was a large contributor as was Clarence and Bellezora Lucas, to the restoration of the house. The estate of Dale & Dora Callison was used for this project. In May of 1984 Margaret Guye, a board member, died and left a large estate to the society. Her will specified an addition to the museum which must contain a library. Dorothy Beeler, Margaret’s attorney Shirley Webster, and LaNelle Bentz were named in her will to be the addition’s committee. The next year, 1985, we were advised by C.R. Bentz that Gilbert Akin had died and left his estate for the construction of a lobby addition to the museum. The two gifts were joined and Richard Casson, Shirley Allen, and Jack Mease were appointed to join Margaret’s committee to work together for the west wing. By the way, Margaret & Gilbert were friends and neighbors and did not know about each other’s wishes – they would have been very pleased. The architects hired were Sires Architects of Des Moines and the construction company was Emcon of Des Moines. Jack Mease was appointed chairman of the committee and was the go between for the board. Through his endeavors construction ran smoothly in 1986 and was completed and dedicated May 17, 1987. There were funds remaining, and the board voted that the money be invested by the executive board and that only the interest from it was to be used for the society’s expenses. The principle could not be used without 100% vote of the entire Historical Society Board. The Depot was moved from downtown to the historical site in 1984. Restoration of the waiting room was done by a memorial to Arling Smith by his wife Mabelle. It was quite a sight to see it being moved. As it went by the elementary school, the children were released to watch. The Zion Church was moved to the site in 1988. The committee for its restoration and the new basement was Richard Casson, Gary and Shirley Allen. Gary and Shirley did much of the restoration work. In 1988 Gary and Shirley Allen gave the gazebo. The ginger-bread work on it was done by them. Many weddings are held here annually. In 1988 the Field’s store was moved. In 1991 Elmer McKee died and with his estate the large McKee Barn was built. The construction company was Buildings, Inc. of Dallas Center and A-Gree Buildings, Inc. We had an evening dedication conducted by his attorney Leonard Flander, and those of you who knew Elmer will appreciate Len’s comment. As you remember he had a slight speech impediment and Leonard said –“If Elmer were here tonight he would look around and he’d say – ‘By Dod, that’s my barn.’” After the dedication we had food and a square dance – a very festive evening! In 1994 the Law Office was built as a memorial to C.R. Bentz. It contains a set of law books dating to the time Iowa was a territory. This collection was a gift to him by Judge Phil Wilkinson of Winterset. In 1994 Mabelle Smith died and a portion of her estate was given to the society. The piano in the lobby is a memorial to her. The remainder was put in the endowment fund. In 1995 the Martin Gas Station was moved. Many of you may remember when it was located by Winterset High School. In 1996 George Mueller, a great nephew of the Societies founder, died and left a large portion of his estate to the society. He was a past president. This money was held in a trust until 2008 and was then put in the Endowment fund. The society has placed a large monument in his family’s cemetery acknowledging his entire family, as a memorial to George. The gifts made by contributors, both large and small are entrusted to the board. They strive to use these funds judiciously to preserve our county’s history realizing the potential for the future is unlimited. Due to this, in 1997 we realized the need to establish an endowment fund and to use professional advisors. There are seven members on this board and they are Herbert Reed, Jim Smith, Jim Mease, Karen Collins, and three members appointed by the society board, Tim Waddingham, Jo Ann Allen, and LaNelle Bentz-Ruth. Our financial advisors are Bridges Financial with David LeGrange personally advising us after the retirement of Dennis Reed. This board meets every three months and all financial transactions are reviewed with David. This board was established through legal advice of Leonard Flander. The principal is kept intact and there can be no use of the principal without the affirmative vote of 5 endowment board members and 75% of all members of the historical society board. The interest of this fund is paid to the board. As you realize at the present our stock market is not friendly and we gauge our expenses accordingly. Our expenses are met by admissions, donation, interest from the endowment fund and interest from the Emma Schroppel Estate. It takes $100,000 – $200,000 annually to operate the Museum. We are very fortunate to have such an efficient administrator, Wendell Spencer since 1994, a most helpful efficient secretary since 1995, Debbie Zacharias, and now a new part-time handyman Don Hixson. Part time employees Mina Jean Slater, Shirley Parkins, Tracy Barongan and Laura Watts are summer employees – all very capable. In 2003 a portion of Clarence Johnson’s Estate was received and in 2008 we were named to receive a portion of the Lura Hoeness Estate. We have been remembered by Dorothy Guye’s Estate which is still in probate. It designates it is to pay the administrator’s salary. We have been remembered recently, 2008, by a portion of Lucile Marten’s Estate.